Inexpensive Christmas gifts for the Italian lover in your life. Five inexpensive Christmas gifts for the person who loves everything Italian. Injecting some Italian spirit into the holiday season is easy if you know where to look. These days it can be hard to find suitably inexpensive Christmas gifts with a genuinely Italian feel - but we think we've done it here. Whether you want to treat yourself, your family or your friends, there's something here for everyone who loves Italy or Italian culture. To see our reviews of these products and to buy if you like them - click on any of the pictures or links on this page. 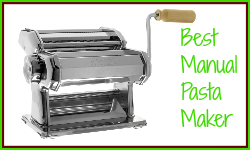 Best inexpensive Christmas gifts #1 : Pasta maker. Italy and pasta just go together. This little machine is a standard part of every Italian home. Inexpensive and simple to use, it makes great pasta every time. Know someone who loves to cook and loves Italy? This could be the answer for their Christmas gift. Gift # 2 : Nativity snow globe by Fontanini. 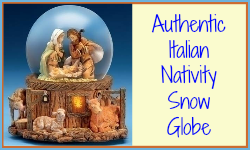 Italian families tend not to go in for elaborate Christmas decorations, but most families have a nativity scene - and a snow globe is a nativity with a twist. This snow globe makes a great gift for younger people or as a family heirloom. 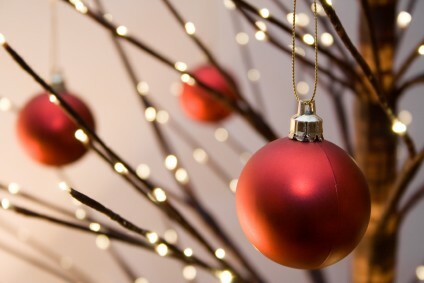 It's symbolic of the real meaning of Christmas - and it's made in Italy. #3 : Inexpensive Christmas gifts for the Italian music lover. 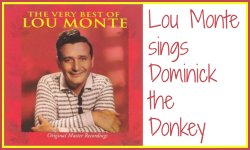 'Dominick the Donkey' may not be the greatest music ever, but it's a big part of Italian-American Christmas traditions and a fun song to welcome Christmas in. It's only one of many musical suggestions we have, but it's probably our favourite. A great little stocking-filler for kids and adults alike! #4. 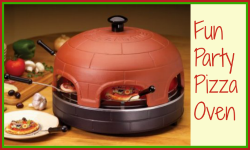 A seriously fun Christmas gift : the Pizza Fondue. Nothing says 'Italy' more than good food and evenings spent in the company of friends, and this six-person pizza 'fondue' provides the potential for both at a very reasonable price. You provide the base and toppings, your guests make their own pizza! A fun, unusual gift for the person who loves socialising round the dinner table. #5. 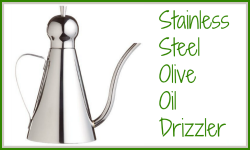 Olive oil drizzler - a must for the food gourmet. Ceramic and glass might be the more popular choices, but Italians know the best way of preserving their delicious olive oil is in stainless steel. The oil is kept dark, cool and away from dirt. This inexpensive drizzler is an elegant and practical addition to the kitchen and the dining-table alike and is a great little gift for the Italophile who loves to cook. Looking for other ideas for inexpensive Italian Christmas gifts? Click on the text or the pictures to have a look at these popular presents. Beautiful Nativity sets from an authentic Italian supplier. Short of time?An electric pasta maker may be the answer.